New Space. The End of Work (is the Beginning of Life). Chicago, IL: n.p. 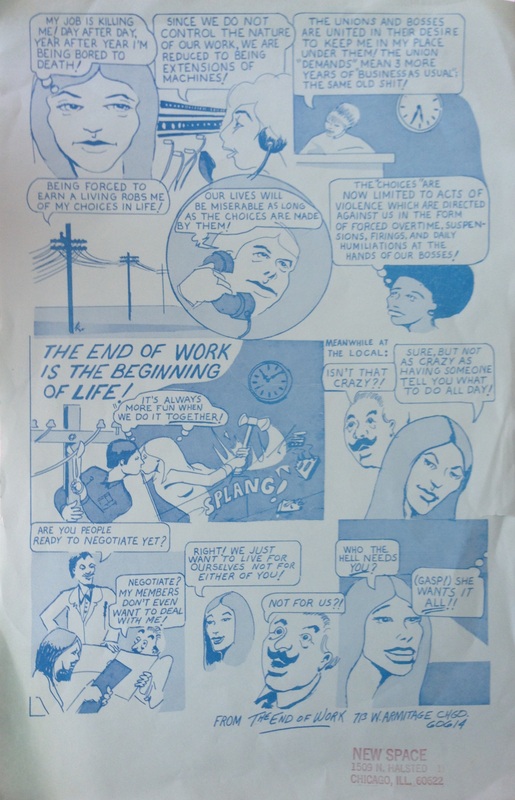 [Solidarity Press], n.d. [July 1974]. 1 p.; 36.5 x 24 cm. ; blue text/illustrations on green stock. 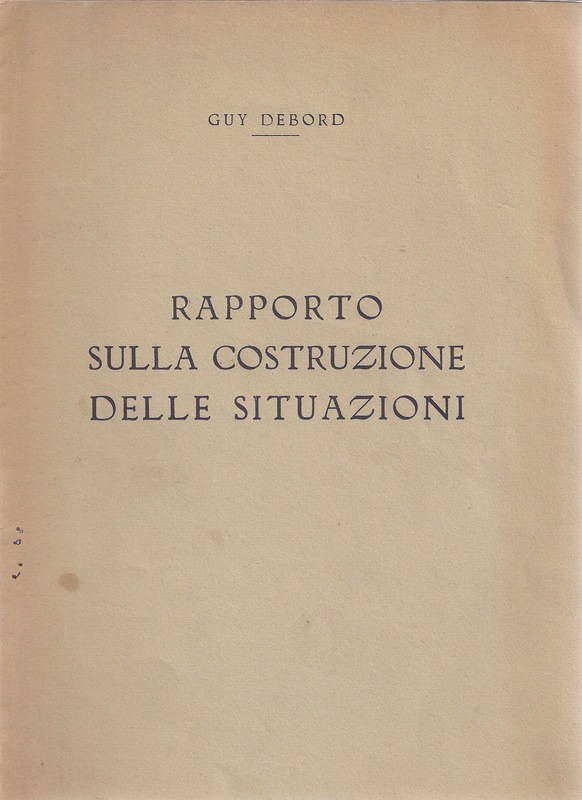 First Italian edition of “Rapport sur la Construction des Situations”, which was originally printed in Belgium by Marcel Marien in 1,000 copies. This text was used the chief preparatory element of the founding conference of the ‘Internationale Situationniste’ in July 1957 in Cosio d’Arroscia. It delineates the views of the founders of the IS (Michèle Bernstein, Guy-Ernest Debord, Giuseppe Pinot-gallizio, Asger Jorn, Walter Olmo, Piero Simondo, Elena Verrone and Ralph Rumney). While the original French edition is rare, with only a few copies on OCLC, the Italian translation is virtually unheard of: no copies in the trade or on OCLC, though the Museum of Contemporary Arts of Barcelona (MACBA) owns a copy. 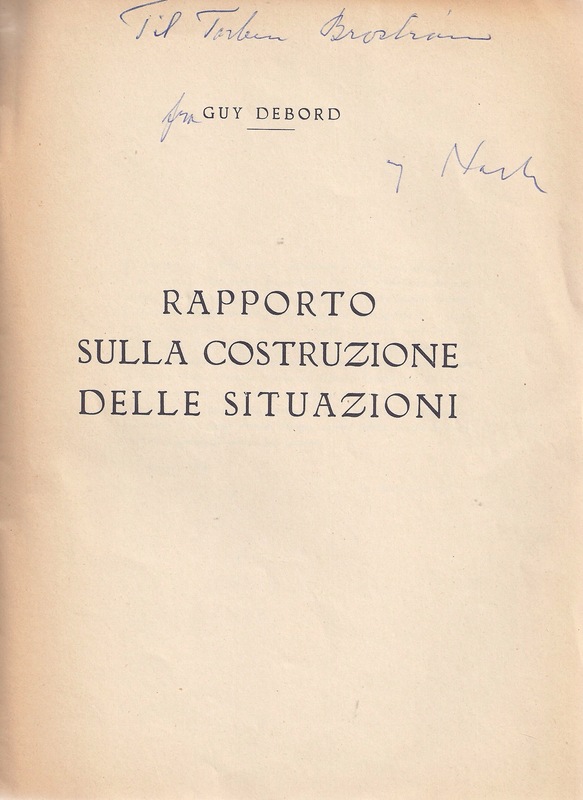 Every word of the text is appropriated – in a few cases from Debord’s own works (including “Report on the Construction of Situations” and the script of “Howls in Favour of Sade”). Other identifiable sources are the plays of Shakespeare, the oratory of Boussett, Baudelaire’s prose poetry, Stevenson’s “Treasure Island”(! ), along with snippets from Apollinaire, Racine, Edgar Allen Poe, François Sagan and de Gaulle amongst many, many others.